The collection will make you dream of a beautiful holiday on the Mediterranean coast. 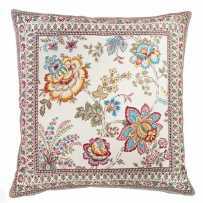 This cushion cover in melted colors is like a souvenir brought back in a suitcase. The front pattern is a postcard come straight from a visit in Nice. In the middle of a faded beige background, elements of a city of the Coast are nicely juxtaposed. There are typical symbols of the region: a small olive branch, a lemon tree from Menton, bring a touch of color. The Jacquard weave gives a very neat look to this decorative linen. The drawings are in slight relief, almost silky. On the back, the background is composed of squares representing decorations of a cathedral facade, rosettes and cut stone. A darker single border forms a frame. This cushion cover will happily meat a couch throw (also sold as a square tablecloth). 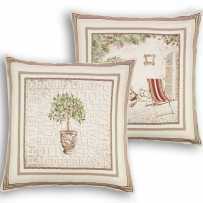 This will give a beautiful, chic ensemble to decorate your living room. You should complete with a table mat or a runner, placemats, or a rectangular tablecloth. All these products are available in unique color, and take again the Riviera theme by adapting it to the formats. We never get tired of it. This item has all the qualities required to be a perfect gift: Jacquard quality, handmade in Provence, tones easy to marry, nice price. Be sure to please a young couple, for a housewarming party or as a wedding gift. In addition, adjust your purchase according to your budget: one, two, three cushion covers, with or without the matching sofa throw, with or without the same size padding. It is a very contemporary collection, more evocative than traditional design. The colors do not take over. This square cushion can easily fit in a truly modern style. You could be tempted to play on the differentiated faces to alternate and break the monotony.